It's nowhere near April yet, but Tinder are clearly already in a fooling mood. CES kicked off in Las Vegas on the 5th and all the big hitters in the tech industry were there, strutting their stuff. Current trends being what they are, that meant that VR headsets were everywhere. That's up to and including the Tinder stall, but the infamous dating app approached things slightly differently. Pledging to "take the 'V' out of VR", they displayed a headset with no screen, or any other kind of audio-visual technology, just a portal to the other end of the goggles - where another person was staring back at you. 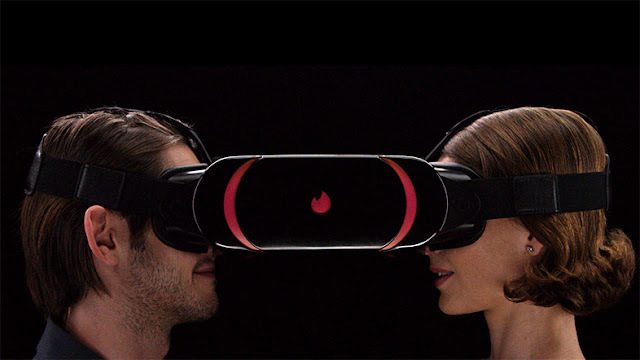 This bizarre contraption basically allows you to stare deeply into someone else's eyes and, as Tinder puts it, have a real experience with a real person. Of course, if you can't find someone else to use the device with you, you probably end up looking like a bit of a pillock. This is Tinder's idea of a joke, poking gentle fun at the VR sensation by softly suggesting that it's a disconnected, isolated experience. There's a twinge of irony to that, considering how many people claim that Tinder's swipe-a-second approach to romance has made dating a more disconnected, isolated experience. That being said, it hardly seems fair to draw attention to Tinder's shortcomings in this context, all they're doing is having a bit of fun. They even produced a sleek, amusing little ad for the headset. Tinder are obviously banking on being as popular with CES attendees as it was last year, second only to Facebook Messenger. Will VR ever be applicable to online dating? It seems like a stretch now, but the technology is advancing at an alarming rate, and being able to interact with people in a deeper way before actually meeting them in person could remove the very barrier that's keeping some people off apps like Tinder.